A heavy snowstorm has swept through US south-eastern states, killing at least three people and leaving hundreds of thousands without power. A state of emergency has been declared in North Carolina, with some areas reporting as much as 0.5m (18.5ins) of snow over the weekend. One man died after a tree fell on his car. A search is under way for a driver whose vehicle was found in a river. Thousands of flights were also cancelled across the region. Snow, sleet and freezing rain continues to impact the South. At a news conference on Monday, North Carolina Governor Roy Cooper said "a year's worth of snowfall fell in some places in a day". More than 300,000 people were affected by electricity outages in the Carolinas, Alabama, Tennessee and Georgia on Sunday, while storm warnings remained in place in the south-east "especially North Carolina and Virginia", the National Weather Service (NWS) said in a tweet. The storm was expected to move off the coast on Monday, although the NWS's lead forecaster Michael Schichtel warned it would continue to be "a dangerous system". "It's slow to move off the Carolinas but a saving grace is that it won't hit New England," he told Reuters news agency. 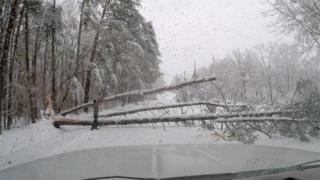 In some areas, so much snow fell the weight brought power lines crashing down. But the main danger appeared to be on the roads. Almost 60 crashes were reported in Virginia, state police told local media, with the number rising to 672 in North Carolina as of Monday morning. NWS officials warned of black ice forming on roads on Monday and into Tuesday. Gov Cooper emphasised that the roads could "turn into ice rinks" even as the storm passes. On Monday, the governor confirmed three storm-related deaths, saying the snow "turned into a nightmare and tragedy". A man was killed in a suburb of Charlotte when a tree fell on his car. A second person was taken to hospital following the accident, WRAL.com said. A woman receiving hospice care in the western part of the state also died during the storm. Near Winston-Salem, another individual died of a heart condition on the way to a shelter, according to the governor's office. Gov Cooper urged residents to check on their loved ones and neighbours, particularly senior citizens. The North Carolina National Guard remains active. The troops rescued 20 people in Wilkesboro, Brig Gen Todd Hunt said at the news conference, and continue to assist with road clearing and traffic accidents. Several hundred miles east, in Kinston, divers were searching for another driver, whose tractor-trailer apparently crashed into the Neuse River. Officials were alerted after debris was spotted on a bridge over the river, ABC12 said.